Do I Need a TSA or FAA Approved Pet Carrier. 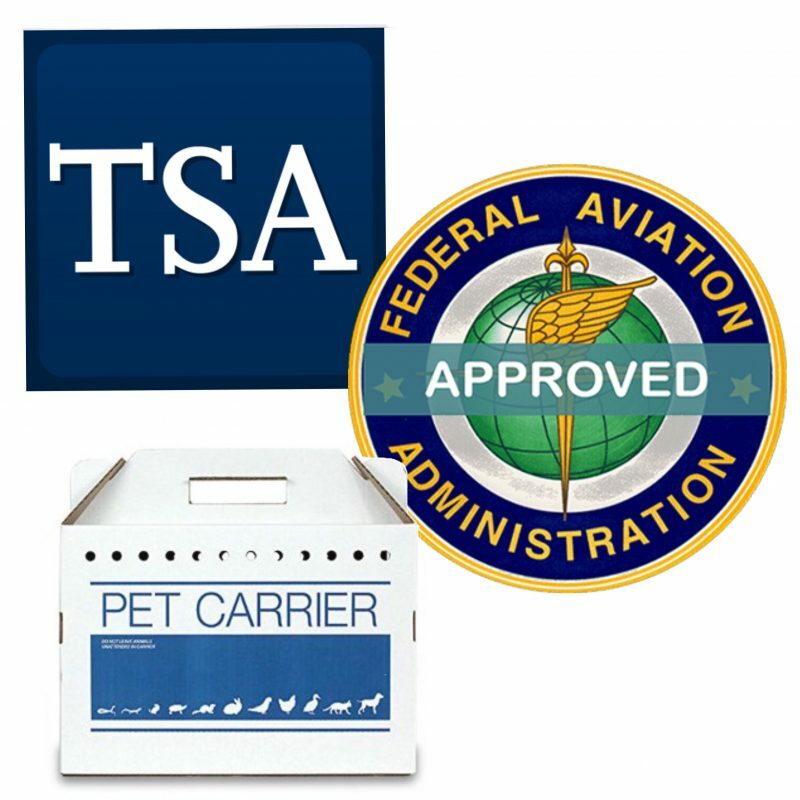 What is a TSA Approved Pet Carrier? What is a FAA Approved Pet Carrier? The Federal Aviation Administration or the FAA, is primarily responsible for the advancement, safety and regulation of civil aviation, as well as, overseeing the development of the air traffic control and actually does not govern or make rules regarding specific pet carriers. FAA regulations, in regards to pets and approved pet carriers, defers to the individual airlines, when it comes to setting specific requirements regarding traveling by air with your pet. Basically, If your airline requires a FAA approved pet carrier, in order for your pet to travel in the cabin with you, your pet’s carrier must abide by the regulations of carry-on baggage. The pet carrier you bring on board, for your pet to travel in cabin on your flight with you, must fit under the seat in front of you and counts as either your carry-on bag or a personal item. Your pet container must be small enough to fit underneath the seat without blocking any person’s path to the main aisle of the airplane. Your pet container must be stowed properly before the last passenger entry door to the airplane is closed in order for the airplane to leave the gate. Your pet container must remain properly stowed the entire time the airplane is moving on the airport surface, and for take off and landing. You must follow flight attendant instructions regarding the proper stowage of your pet container. More information regarding Pets in the Passenger Cabin is available on the FAA website. Airline have their own rules, regulations and requirements for people traveling with pets on planes. For in cabin pet travel, most airlines require the pet to be contained in either soft- or hard-sided pet carrier. In addition to complying with carry on size dimensions, the carrier must be leak-proof and ventilated on at least two sides. Some airlines also require the pet to be able to stand up and turn around inside the carrier, and can deny boarding if your pet carrier does not comply with their pet policy requirements for in cabin travel. For information regarding your Airline’s Pet Carrier requirements, Please contact your airline directly, prior to travel. Also, please inquire about health certificates and any other policies, requirements or restrictions they may have. What is an Airline Approved Pet Carrier?